synopsis - You can call it Anglo-Saxon Metal. Fact is that this sparkling and fierce Pagan with many melodic Black tones, praising the Anglo-Saxon ancestors, created by the brothers Athelstan and Wulfstan from Surrey, England, is surely enthralling. It brings all the keys to Pagan: Melodic Black feelings united with Power/Medieval and obscure influences, proposed with that unique British catchiness that makes things immediately nice and accessible even when it's blasting assault. In the general hightuned atmosphere they deliver very good blasting (machine) drums and passages of heavy Metal, and that anthemic almost epic tone which makes group, that makes exaltation. Choirs and vocals are not that difficult, between sung-in-clear and thin evilness (vocals indeed are not aggressive enough). 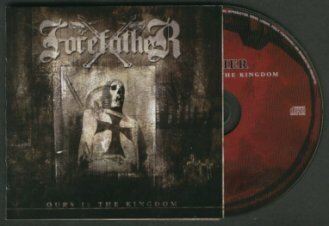 Ours is the Kingdom could open the door to Melodic Black, melodic Death and Pagan to all who still don't understand these genres. The perfect fusion between Power anthemic schemes and Dark Extreme makes it attractive for Power Metallers too. On the other hand, many influences coming from various sources at times surface clearly, penalizing just a bit the originality of the catchy melodies . review - Dragon slayer, heroes passed, shining realms in ruin, falling towers of stone. This is not a fantasy concept of "retro" Power, these are simply words taken around from the lyrics of "Ours is the Kingdom", words dedicated to the glorious Anglo-Saxon ancestors. To praise ancestors and own land, to be proud about them, is an honorable thing as long as it doesn't turn into chauvinism. Nevertheless, the brothers Athelstan and Wulfstan, founders of Forefather, transfer much of sincere respect and enthusiasm into the mirror of the past of their folk. So, let's listen t o this Anglo- Saxon Metal empowered by a certain "crusader" image too. No fear: it's Pagan/Melodic Black with an anthemic epic spirit ! It's music that immediately catches you in its web. Generally hightuned guitars are counterbalanced by resolute blasting but not too invasive machine- drums (at least i presume they are such), slower pounding passages Heavy Metal oriented, very catchy hymns, intelligible vocals (that anyway should be more aggressive). Small elements of Power and Medieval match very well this catchy but fierce motion. And if you are not able to understand Pagan, Black and Death after having listened to this album, sorry, but you're simply a hopeless case. To complete the product there is a brilliant booklet with images and lyrics, in sepia/blood look and a satisfactory care for sound. The Shield - Wall surprises us immediately with its fast hightuned tremolos, its resolute bass drums, virtuoso work of guitars, calm vocals inserted in an anthemic spirit, expressed with a very catchy refrain and enjoyable verses. It's immediately group, it's immediately action and feeling of being united. These feeling is carried on by the title track Ours is the Kingdom, whose choirs of brotherhood at once appear catchy, nice, enthralling, without giving up heaviness or aggression. Both songs are varied thanks to perfect and agreeable tempo changes. But practically every track offers interesting pace changes, catchy lines full of hooks and melodies, among relentless neckbraker assaults in flames. The same can be said indeed about Proud to be proud, built both on furious attacks and marchin' on pounding rhythms and hymns. The Golden Dragon is very cadenced, supported by an excellent guitar work, and finally featuring more force in the vocals. Smashed by Fate draws many Pagan/Folk/medieval atmospheres. The instrumental The Sea Kings, that opens with the sound of sea- waves under the storm, can only be loved or hated: really winning or hazardous, it depends from what you think about Pagan atmospheres evoking a chill out a bit à la Enya, though much stronger and more rhythmed. With its pounding drums'n bass and orchestral appeal lets me without words, detestable but beautiful. And after this moment of chill out of steel, thunders and hymns again with To the Mountains they fled, very Power oriented in its basic melodic lines, some passages of which remind of the old Helloween of the Keeper of the Seven Keys era; a darker riffage of mighty guitars and ghostly backscape is the ideal intermezzo in order to break a bit the Power proceeding. The Folk that Time forgot is a brilliant song cause it has much of Dark Metal and melodic Black even with some Gothic drops. But here again the refrain gives to me a feeling of dejà vu... Sparkling, enjoyable and full Pagan is Threads of Time, followed by the rather long (5:59) and slower Keep marchin on, whose title says it all, a certain vein of sadness included, anyway energetic riffs and an intense speed -up- riding are not missed, with well underlined bass lines. Rebel of the Marshlands is very attractive between blasting Black attacks, walls of riffs that put oil on the flames and a slower bridge, anyway once more a couple of notes come some how already known. Wudugast closes the album with excellent harmonic lead guitar sounds, more or less distorted, towering over the pounding midtempo and following really nice melodies that shift the music towards melodic Heavyn' Dark with a shadow of Van Halen Rock running in the background. In my opinion, Wudugast is the best track of the album; it closes the album in a bit different way if compared to the rest of the tracks: a song a bit distinct from the rest, with Death drumming ...and so sorrowful.